Be a part of Our Entrusted Verification and Attestation Services | "Transforming Governance Beyond Boundaries"
Document verification and attestation is an essential prerequisite today whether you are voyaging abroad on a holiday or travelling for a business meet or higher studies. Like passport and visa processing, one of the imperative things that an applicant needs to undergo here is pertinent documentation (academic, personal and commercial).The reason being; if your documentation falls short of the Embassy/Consulate’s directives, you may face some unwanted perils pertaining to your Visa processing and stay in the visiting country. This is where the requirements of verification and attestation services come into existence as a sign of affirmation regarding the provided documents. The term ‘Attestation’ asserts the genuineness of a given document or certificate, which gets issued from a particular board/department. Once the given document or certificate is legally verified with the seal and signature of the respective authority, it is considered as verified and attested for further doling out. So if anyone thinks of getting his/her required document attested in person it can be quite taxing and intimidating experience all together; and this is where an authorised verification and attestation service provider takes the lead in fulfilling allthe documentation needs of an applicant. BLS International has been entrusted as one of the acknowledged apostille and attestation service providers for several Governments in India as well as across the sphere. The organisation functions as an administrative link between the Governments and the applicants in managing the entire process. While performing its verification and attestation services, the organisation accepts documents from the prospective applicants and representatives on behalf of the Government, which further facilitates the Ministryby rendering bona fide Ministry Attestation/Apostille services. The key attestation attributes that can be availed here include; Embassy Attestation, State Attestation and MEA (Ministry of External Affairs) Attestation. The organisation focuses on providing cutting edge and holistic services backed by dedicated and nimble in-house support. Besides lending an impeccable verification and attestation service, BLS International also provides a range of additional services to the applicants pertaining to translation, SMS and courier, etc. 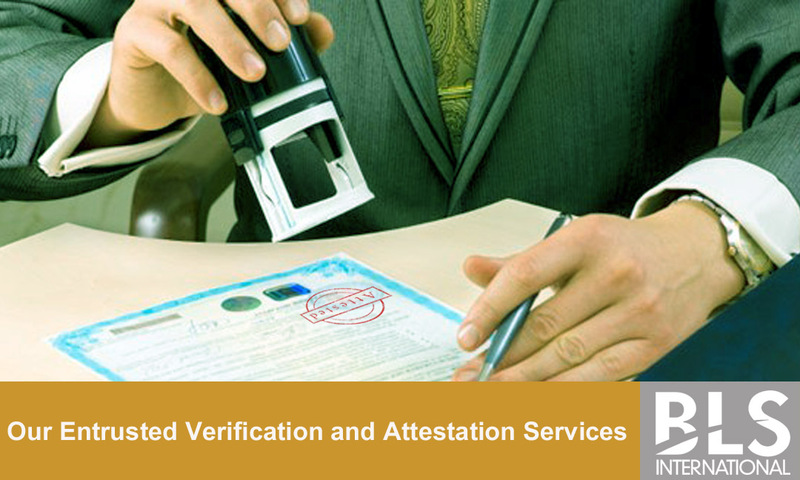 So if you are in quest of an authorised reliable attestation and verification service provider, reach out to the one-stop solution provider, BLS International for getting your all kinds of attestation requirements without any hassle.